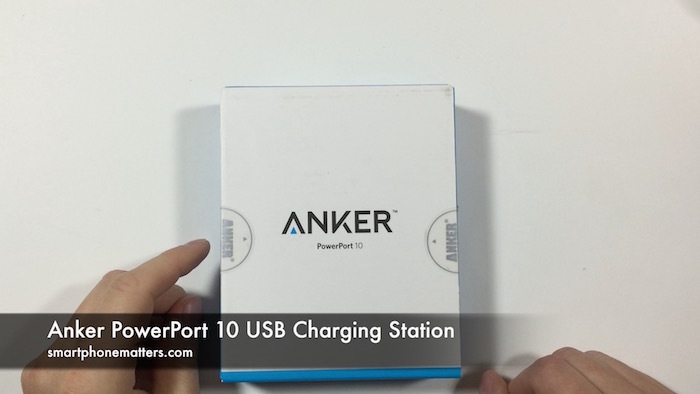 In this video I take a look at the Anker PowerPort 10 USB Charging Station. I bought this item about a year ago and it’s been sitting here on my desk under a pile of stuff. So today I finally decided to open it up and make this video. After I a little effort I managed to get the box open. Inside I found the PowerPort 10 charger, the power cable, a small velcro strap, a charger installation adhesive strip, and some documentation. The PowerPort 10 is black, but it also is available in white. has 10 USB ports along one of the longer sides of the unit. On the opposite side, there is an on / off power switch and jack for the two prong power cord. In the video, I show the my current 6 port Anker USB charger, suprisingly the Power Port 10 isn’t physically much larger. This is because the USB ports on the PowerPort 10 are along the longer side of the device. The power cable is a two prong cable with a C7 plug on the end that plugs into the charger. The small black velcro strip is for keeping the power cable secure when wrapped. The charger installation adhesive strip is a double sticky sided pad that is used to secure the charger to a desk, wall, or where ever you’d like to mount the charger. This is a nice touch. I currently use gaffer’s tape to hold my charger in place. There was some documentation in the box I have yet to look at. The Anker PowerPort 10 is a 10 Port USB charger. Even though it is a year old, Anker still makes this model. It currently sells for about $40 on Amazon. I have a number of Anker USB chargers around my home and office and I am quite happy with them. I’m going to replace the 6 port model on my desk with this one. You can see that all the ports on my current charger are in use. With a quick look around my desk you can see I have three iPhones, two Nexus phones, and an iPad Air. That alone is enough devices to fill up my current charger, let alone the other random devices I have that require USB charging. Anker still sells the PowerPort 10 even though this model is at least a year old. I checked anker.com and it is still listed with their current charging products. I also check Amazon.com and the PowerPort 10 is still available for $39.99. I don’t remember off hand what I paid for it last year. Some of you may be wondering the PowerPort 10 supports quick charging for devices like the Nexus 6P and Nexus 5x. As far as I can tell, it does not. If you want quick charging checkout the other models in the PowerPort+ models. From looking at Anker.com, it looks like these models do support quick charging. Quick charging isn’t a big deal for me, devices on my desk have plenty of time to charge. I think Anker multi port USB chargers are a great deal. For $40 you could by two Apple chargers and charge two devices. With the PowerPort 10, you get 10 ports for $40. I really like Anker products.